NEW ORLEANS — The most important thing to remember about high-profile sports losses is that the losers are still better than just about anyone is at anything. That is, perhaps, part of why sports are fun the average fan–who’s no stranger to not being the best at something–gets to partake in the illusion of an elite losing just like them. So keep that in mind when you check out the All-Loser Team listed below. The research in this article is mostly based on this history book PDF containing the best marks at the NCAA meet by place; as always, make sure to check out our entire history book project and then tune in for next week’s NCAA championships on ESPN. We’ll start with track & field’s smallest violin, and gradually lengthen our strings. Out of all of the athletes to pity in this article, your heart should be most grinch-like for Oregon’s Edward Cheserek. He has one of three performances we could find that find that would have been a current NCAA championship record–if they weren’t beaten on the day. Lalang dethroned King Ches 13:18.36 to 13:18.71; those times are the fastest that either has ever run in-season. (Lalang ran 13:00 in Monaco the summer after his junior year.) As close as it was between Ches and Lawi on the track, three men–including Jenkins, who ran his PB at Northeastern–are squeezed into the third of a second that separates the two Kenyans on the all-time list. Minimize the amount of liquid you sacrifice in mourning Cheserek’s loss, though. In less than two seasons, he’s won six NCAA championships. Our other two athletes in this category never won an individual title, though one has plenty of laurels. Bennie Brazell is the first athlete in LSU history to win team national championships in two sports. He was on multiple track & field national title teams for the Tigers, and was a wide receiver for the 2003 national championship-winning football team. But his timing was brutally bad in the 400 meter hurdles. He took second as just a freshman in 2002, fourth as a sophomore in 2003, second again in 2004, and second in the greatest 400 meter hurdle race in collegiate history in 2005. His time of 47.67 seconds in Sacramento would have broken a seventeen-year-old collegiate record… but Florida’s Kerron Clement beat him to the line by a tenth of a second. A decade later, Clement’s 47.56 and Brazell’s 47.56 remain the two fastest college times ever. As unfortunate as Brazell was, he at least has fistfuls of relay and team titles. Our next runner-up is the least lucky of them all. USC’s Aleec Harris covered the 110 meter hurdles in 13.18 seconds at last year’s West Prelims–at the time the fastest collegiate hurdles performance in thirty-five years. And he repliaced the time–with less favorable wind!–in Eugene two weeks later. Unfortunately for Harris, Oregon freshman Devon Allen ran 13.16 seconds for the win. Those are, as far as we can tell, the two fastest wind-legal times in NCAA meet history. Allen had never come within a tenth of a second of that time before that race, and he hasn’t competed on the track since winning last June’s USATF championships. If Cheserek, Harris, and Brazell turned in the three best second-place performances ever, then Florida’s Dion Bentley has a strong claim to the No. 4 spot. His runner-up finish in the 1993 long jump was the third best collegiate jump ever at the time, and it took an NCAA record to beat him. 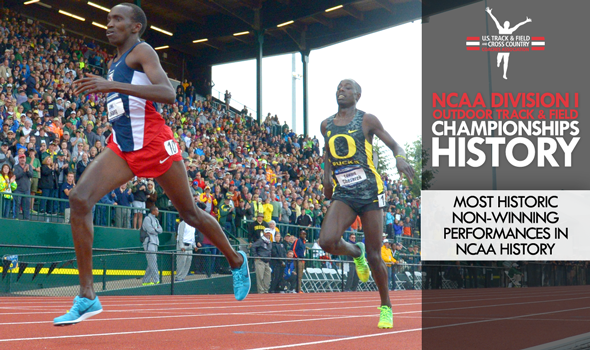 Unlike Harris, Cheserek, and Brazell, he didn’t beat the pre-existing meet record. The Florida then-junior did, though, jump 8.39m (27-6½) in New Orleans for what is still the eighth best long jump in collegiate history. Arkansas’s Erick Walder beat him with a still-standing meet record of 8.53m (28-0) that year. The top four jumps from that meet are still the best jumps ever for first, second, third, and fourth places, respectively, in NCAA meet history. The last decade has seen an incredible renaissance in American women’s middle and long distance running, and while it didn’t all start at the NCAA level, a good deal of it did. Three races in 2007-08 are great examples of this. In 2007, Alysia Johnson of Cal edged out Michigan’s Katie Erdman in the 800 by 0.06 seconds. Johnson ran 1:59.29 and Erdman ran 1:59.35; they remain the only two women since Suzy Favor set her still standing meet and collegiate records in 1990 to have broken two minutes in-season. At the same meet, Michelle Sikes of Wake Forest torched the 5k field in 15:16.76. Behind her, future superstars Sally Kipyego and Molly Huddle ran the fastest second and third-place times in NCAA meet history. Huddle has the unusual distinction of setting the American Junior record in the event as a teenager and the American record as a professional, but winning exactly zero collegiate championships in between. Kipyego–the 2012 Olympic silver medallist in the 10k–went on to win the 5k at outdoor nationals the next year. Because she has the medals, Kipyego can live with the dubious distinction of having the best second-place time in two different events. A day after winning the 2008 5k in meet record time, she lost the 1500 to Florida State’s Hannah England, who ran 4:06.19 for a still-standing meet record. Kipyego’s 4:06.67 and Sarah Bowman’s 4:07.50 are still the fastest second and third place times at NCAAs. The last distance entry is the 2011 men’s 800 meters. That year, Charles Jock, Elijah Greer, and Cas Loxsom ran the fastest second-, third-, and fourth-place times in meet history. Jock’s 1:44.75 ranks him No. 8 in collegiate history, is just 0.05 shy of the meet record, and lost to Robby Andrews by 0.04 seconds. Just watch the race yourself. Only one of the nine fastest 4×400 meter men’s schools ran their fastest time in a race that they didn’t win. The 2005 Arizona State Sun Devils, featuring Rich Allen, Seth Amoo, Domenick Peterson, and Lewis Banda on the relay, ran 3:00.57 behind LSU’s meet and national record quartet that included Bennie Brazell and Xavier Carter. Arizona State, like Bentley, can’t even be the best at losing–though they have the country’s fastest school record that was set in a loss, last year’s Florida team actually has the fastest second-place time ever. The year before, South Carolina’s Lashinda Demus ran 54.22 seconds in the women’s 400 hurdles, which would have snuck under the old collegiate and meet record by a few hundredths of a second. But that record was held by Sheena Johnson of UCLA, who ran 53.54 seconds to set collegiate and meet records that would stand for nine years. Johnson and Demus were replaced as the fastest winner and loser in 2013, when Kori Carter broke Johnson’s record in 53.21 seconds and Georgeanne Moline inserted herself betweeen Johnson and Demus on the all-time list. Dianne Guthrie’s 1995 heptathlon meet and college record turns twenty this year, and with no one within two hundred points of it, Guthrie’s 6527 points will likely start a third decade on top. The closest anyone has come to that mark with the new javelin implement is Brianne Thiesen’s 6440 in 2012. After Eaton graduated, no superstar heptathlete emerged immediately, but several excellent ones did. That became evident in the 2013 heptathlon, where less than two hundred and fifty points separated Lindsay Vollmer in first place and Allison Reaser in eighth. Makeba Alcide, Keia Pinnick, Erica Bougard, Tanya Friesen, Vanessa Jules, Lucie Ondraschkova, and Allison Reaser set the best marks in meet history for second- through eighth-place finishers behind Vollmer. Brittany Riley set a world record and won indoor national championships in the weight throw. And she’s one of the best collegiate hammer throwers ever. But she was a champion loser in the hammer throw, taking fourth in 2006 and second in 2007 and 2008. She has two of the three best hammer throws in collegiate history, but had the misfortune of her first three years overlapping with national record holder Jenny Dahlgren and committing three finals in her final championship. CHAMPIONSHIPS HISTORY: What If The Bowerman Trophy Existed Before 2009?